Time for Top Ten Tuesday again, and I really wish I'd thought to vlog this week's topic, 'cause it would have made an excellent discussion vlog. This week, we're talking about the Top Ten Most Unique Books We've Read, and I have to say, I strongly recommend each and every one of the books listed below. Let me know if you've read these, and what your take on them was, and tell me some of your picks for most unique in the comments! Narrated by one of my all-time favorite, most unique narrators, Death himself, The Book Thief is full of surprisingly gut-punching insight. The way Death sees things, the way he phrases his observations and studies humanity — and the inhumane things we do to each other — makes Death one of the most memorable narrators I've ever had the pleasure of reading. A strong story led by another unique narrator; this time, it's 15 year old autistic boy, Christopher, who tries to logic some sense into the uncomfortably unpredictable world around him. Christopher is charming, frustrating, funny and heartbreaking, and I loved every last bit of his narration. Bonus points for having a pet rat. Cloud Atlas may be the single most frustrating and the single most rewarding thing I've ever read. This was the first book to ever make me jealous I hadn't written or conceived it, and I've long since called David Mitchell my favorite living author as a result of this and the rest of his amazing body of work. Though my technical favorite may be number 9 dream, this is certainly his most impressive. The literal telling of this book is what makes it so unique. It's printed accordion style, meaning you don't flip the pages so much as pull the front cover up up UP and let the story unravel... and when you get to the end, you flip it over and read it again from the other side, getting two sides (literally and figuratively) of the same story. You can start at either end, and each story influences how you interpret the other. It makes for a pretty interesting reading experience, to say the least. Sara Varon man... She writes (and illustrates) these insanely unique stories with forever-memorable characters, and they are quirky and affecting and oddball. Robot Dreams is a nearly-wordless comic that made me cry a lot; Bake Sale is a comic about a cupcake who owns a bakery, and his rock-n-roll friend, Eggplant. It might be an acid trip in book form, I dunno, but unique and memorable it certainly is, and weird as they both are, I loved every last minute. *I'm counting these as 1 because I chose them for the same reason. 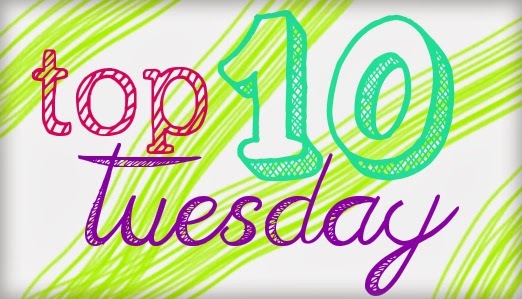 And yes, I know I always go over 10 in Top TEN Tuesday. Hush. American Born Chinese was the first graphic novel to be nominated for a National Book Award, and it was a finalist for the prize, with good reason. Told in 3 separate and totally different stories that come together beautifully at the end, this is a powerful exploration of racial identity and coming of age. One of my favorite books for a reason. It's rare enough to get an epistolary novel these days (ie. it's told through a series of letters), Perks is the master of the slow reveal and the seeming non-sequiter. Charlie just comes out with stuff out of the blue, and you're constantly wondering just what is going on with this kid - and when it's finally revealed, you've made such a connection with him that you feel for him much more so than I think you would if it were told in a more traditional manner. I mean... it's Chuck Palahniuk, so of course this book is totally FUBAR. It's told via 23 separate stories that are framed within one over-arching one, and I'd be hard-pressed to tell you which is the most disturbing of the pack. Memorable, to say the least. I love a story with a debatable open-ending — something that lets readers interpret and ponder and go back and forth with what they think may have happened, could have happened, and should have happened. Godmother is told in alternating timelines and styles — one present-day New York, and one some nebulous fairy tale past — and the reader is left to wonder which version of reality they're presented with is real, or whether both are. Excellent fodder for book discussions and for rereads. Honorable mentions to Tweet Heart, a book composed entirely in tweets, emails and the like, that somehow managed to not drive me insane; and actually go so far as being a cute, cohesive story, Tin Star, which is an entire cast of unique characters in a unique situation, with fairly non-human reactions and interactions ('cause they're, you know, aliens and stuff); and along those same lines, All These Things I've Done, which gives us one of my favorite narrators, who starts out very cold and distant, and fairly atypical for a YA read. It's so good! Each section is a totally different story in a totally different style, and then when they come together, it's a POW. I really need to read an AS King book. I feel like I'm missing out on something special. Also I loved your description of Cloud Atlas as "the single most frustrating and the single most rewarding thing" you've ever read because that is definitely how I feel about it. I didn't know about some of these, but now I want to try them. For me, I would add The Guernsey Literary and Potato Peel Pie Society b/c its epistolary and the first I've read and Made of Stars because of the atmosphere of the book and its open ended ending. I'm sure there are more, but that's what I've got. I have the Guernsey Literary..., and have had for years, but still have not read it. Really need to get around to it one of these days. I gave Cloud Atlas a place on my list too. A.S. King rocks and I've only read one of her books. I have the rest waiting here, but part of me doesn't want to read them because then I won't have them to look forward too! American Born Chinese and Boxers & Saints will be read this month since one of the book groups I belong to is reading Saints as its selection this month. Great list :) Perks made my list too, such an amazing and brilliant book and most definitely unique. I also really enjoyed The Book Thief, loved how unique that was and the narration by Death. My TTT. I'm planning to reread The Book Thief soon. Probably one of the best books I have read.